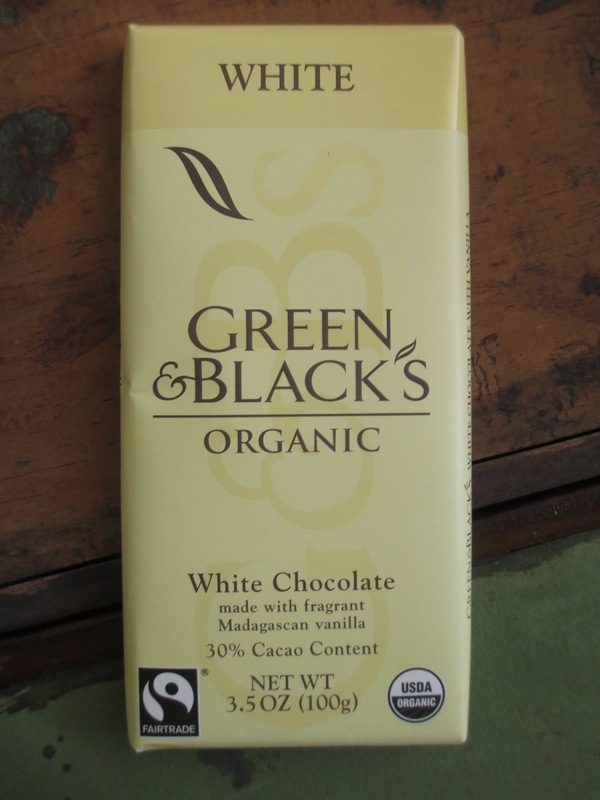 Green & Black's is the original conscious chocolate brand. They were out there promoting a new attitude toward chocolate before many of today's top companies with the same style even existed. Green & Black's being the type of company that is also content to stick with a good product versus constantly trying out new or trendy flavor combinations, I long ago stopped paying attention to them. 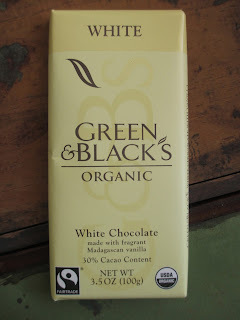 In fact, I only buy Green & Black's now if I'm in a pinch and need chocolate for a recipe (usually I have plenty on hand leftover from all my reviewing). It's been so long that I don't even remember what Green & Black's tastes like--or which of their bars I reviewed online (for Chocablog). I think most of my reviews of Green & Black's were what I call my "practice reviews," reviews that I never published or posted anywhere but simply wrote in the beginning for fun, the short pieces that helped me get the hang of the style. So I thought I might try and start over and review Green & Black's sometimes. After all, I know that I've never done any reviews on their products on this blog. I'm also giving a second look at white chocolate. After enjoying the white chocolate truffle from Black Butterfly, I started wondering why I (probably like many people) avoid white chocolate. It's nice when I do eat it--I just never choose it. 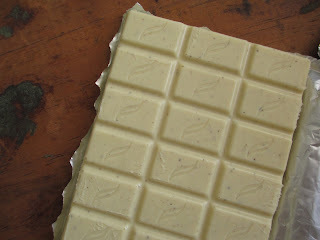 Today, then, I'm looking at the Green & Black's White Chocolate, which comes in at a 30% cocoa content. White chocolate, as you know, contains only cocoa butter as its sole cocoa bean derived ingredient. That's why it can look and feel like it's missing something--if you compare it to milk or dark chocolate. And you'll also want to remember that many candies are called white chocolate when they don't even have cocoa butter; there is of course a huge difference between simply sugar and sugar with cocoa butter. I'm still used to the Green & Black's outside packaging because their bars are for sale everywhere, but I had forgotten how nice their foil is. An almost matte, slightly coppery gold with the G&B name printed in shinier letters. Then the familiar twenty-seven pieces are inside with their little leaf logos. Beneath the creamy white surface, you can see the spots of Madagascan vanilla. I do love to be able to see the vanilla because this proves that there is real vanilla. The chocolate smells like butter and sugar and vanilla, like a combination confection and ice cream shop. The flavor, too, is butter and vanilla with plenty of sweetness. Remember that while the ingredients may all be organic, the first ingredient is still cane sugar (followed by the cocoa butter and milk powder and vanilla). So you approach a bar like this in the same way that you would approach a dish of vanilla ice cream: with an appetite for the sweeter things. That said, something sweet can still be cheap or not. Here, of course, you can tell that the ingredients that form the basis for this sweetness are quality. And I would say that this chocolate has less of the slight chalkiness that's usually characteristic of white chocolate (and which I don't really mind); I'm not sure if this is a result of how it was made or if it's just that I'm tasting so much of that vanilla that I can't notice anything else. The vanilla is the primary flavor, which is why I compare this chocolate to vanilla ice cream. And while I wouldn't want to have only white chocolate and never any milk or dark (are they even the same species that we can try to compare them? 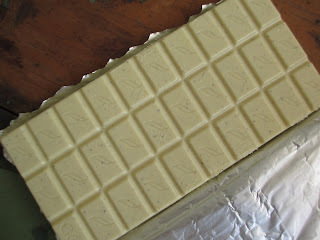 ), I think I will try and give a little more attention to white chocolate in the future. You see, this chocolate reminds me of all those weird candy bars, like cookie dough flavor and that sort of thing (not that I've ever had cookie dough candy, but I see it around). So I feel like people who crave that type of sweet and that type of indulgent "chocolate" might be able to use white chocolate as one of their candy bar replacements. This is me advocating for choosing fair trade chocolate. I can understand how you might not want to replace cookie dough chocolate with most of the fair trade bars (even their milk chocolates tend toward the "darker" side and the fair trade candy bar market is still developing). So try white chocolate. What I'd really like to see is a milk chocolate with a white chocolate center. I feel like I've had this before (maybe from Ritter Sport? ), but I want one of the organic/fair trade brands to do it. I can't see Green & Black's trying it because that just wouldn't be their style. Theo, maybe? My point is, by looking back at an old reliable brand like Green & Black's, I'm looking forward to a new zone of possibilities.